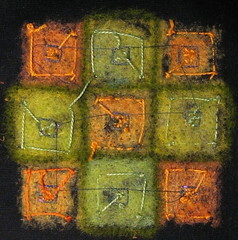 Another nine patch sort of object. There are pieces of this one I love so much! 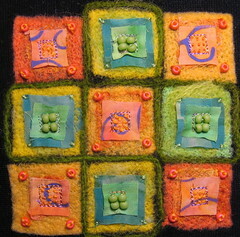 The tiny stitches inside the orange squares, the way the green beads lok like eggs in a nest, the subtle differences of greeny-yellow and yellowy green in the 4 pieces, and the variations in oranges across the corners and center. I feel like I am starting to get a grip – on the machine and the results. Even the back looked cool on this one. See? This is really nice. Love the colors!